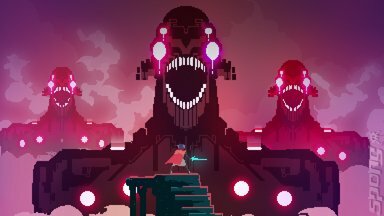 Hyper Light Drifter is not particularly technically accomplished. Nor is the game design particularly original. Hell, it's not even slightly original. It's been the most compelling game I've played in ages. I was first attracted to it by the art style and visual design. Not the pixel art. That's fine, if a little played out. Rather, it was the blasted neon landscapes in the screenshots. The weird, post-singularity, post-human, post-Lovecraftian, waaaaaaaaay post-cyberpunk world of forgotten technologies and indistinguishable-from-magic science. And the understatedness of it all. The environment is scattered with opaque hints that there's a whole strange world beyond your corner of it (and even within your corner of it). It's all dripped out to you in sparse interactions and environmental clues, giving the game a desolate beauty that's fed perfectly by a moody synth score. 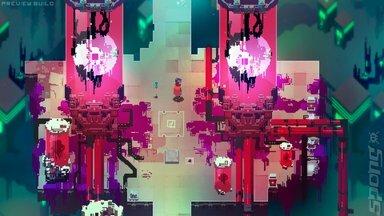 Hyper Light Drifter certainly has issues. At times you wonder if the minimalistic storytelling is just a front for there not actually being any story. The upgrades to your abilities could be a little more interesting. At times the difficulty suddenly spikes, or the way forward is just too obscure. But this weird, sad, beautiful world that you're just thrown into and forced to try to figure out will stay with me for a long time.